Are we irrational creatures, swayed by emotion and entrenched biases? Modern psychology and neuroscience are often reported as showing that we can’t overcome our prejudices and selfish motivations. 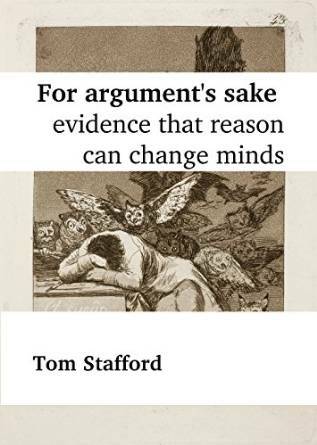 Challenging this view, cognitive scientist Tom Stafford looks at the actual evidence. Re-analysing classic experiments on persuasion, as well as summarising more recent research into how arguments change minds, he shows why persuasion by reason alone can be a powerful force. “either/or/both/and”. Sometimes, rational, cerebral cortex arguments win the day, and sometimes our irrational, arbitrary, emotional, limbic system calls the shots. I only recently found this Mindhacks site, and I like it so far, so THANK-YOU, Tom. Only ebook? Only Amazon format ebook? I want to read it, but I’ll wait. Evidence that people are Bayesians, after all? you convinced me to but it already! I must be really rational! Freud and the huge post-freudian tradition says both reason and non-reason. Norman Doidge in The Brain That Can Change Itelf) says you yourself can push balance- to an optimum degree -in favour of reason. (Why would one strive for TOTAL reason???) We’d end up being another species. I thought the article in Contributoria was good. I didn’t know about the research on collaboration on solving a Wason problem. This also struck me as a particularly interesting observation. “So striking is the success of reason when deployed in the service of argument that two cognitive scientists, Dan Sperber and Hugo Mercier, have even proposed that this is what reason evolved to do – convince other people in arguments, a legacy of our biological nature to live in social groups. This explains the success of groups on problems that confound individuals, and also explains why we are so good at thinking up reasons why we’re right, even when we’re wrong. Just bought it on smashwords! Thanks!